Intradural or primary spinal cord tumors (neoplasms) are uncommon lesions and fortunately affect only a minority of the population. However, when lesions grow, they result in compression of the spinal cord, which can cause limb dysfunction, motor and sensation loss, and, possibly, lead to death. Spinal tumors are classified based on their anatomic location as related to the dura mater (lining around the spinal cord) and spinal cord (medullary) as epidural, intradural extramedullary, or intradural intramedullary. Primary spinal tumors are typically intradural in location, where extradural spinal tumors are typically due to metastatic disease. This article focuses on the evaluation and management of intradural intramedullary spinal cord tumors. The typical histopathological types that account for 95% of these intramedullary neoplasms include astrocytomas, ependymomas, and hemangioblastomas. Spinal cord astrocytomas and ependymomas can be further classified as glial cell neoplasms. [1, 2, 3, 4, 5] See the image below. This T1-weighted sagittal MRI is from a 19-year-old man with 4-month history of progressive motor loss and an inability to ambulate. He underwent spinal biopsy that confirmed an intramedullary glioblastoma. In 1887, Sir Victor Horsley performed the first successful resection of an intradural neoplasm diagnosed by William Gower. This lesion was an intradural extramedullary tumor that compressed the spinal cord. However, the patient did not survive the intervention. Due to limited operative techniques, the first successful removal of an intradural intramedullary tumor, performed by Eiselsberg-Renzi, did not occur until 1907. In 1925, Charles Elsberg published the first large series of patients who underwent resections of primary spinal cord neoplasms. Unfortunately, again because of the limited operative techniques of this period, these patients endured significant surgical morbidity and mortality. However, subsequent advances in imaging, sterile operative techniques, microsurgical dissection, operating microscopy, and neurophysiologic monitoring have facilitated removal of these lesions with substantially improved clinical results. Spinal cord parenchyma consists of both gray (neurons and supporting glial cells) and white matter (axonal) and tracts that transmit impulses between the brain and body. These tracts, or circuits, control posture, movement, sensation, and autonomic system function, including bowel, bladder, and sexual function. Neurologic dysfunction develops as the spinal cord tumors enlarge and compress adjacent healthy neural tissue, disrupting these pathways. Upon further compression, patients can lose complete motor function and sensation below the lesion. In addition to weakness and sensory loss, patients may experience pain, particularly at night. This pain is believed to be related to disturbances in venous outflow by the tumor, causing engorgement and swelling of the spinal cord. Intramedullary spinal cord tumors account for approximately 2% of adult and 10% of pediatric central nervous system neoplasms. In adults, 85-90% of intramedullary tumors are the glial subtypes, astrocytoma or ependymoma. Ependymomas account for approximately 60-70% of all spinal cord tumors found in adults, while, in children, 55-65% of intramedullary spinal cord tumors are astrocytomas. Hemangioblastomas account for 5% of tumors, whereas paragangliomas, oligodendrogliomas, and gangliogliomas account for the remaining lesions. The pathogenesis of spinal neoplasms is unknown, but most arise from normal cell types in the region of the spinal cord in which they develop. A genetic predisposition is likely, given the higher incidence in certain familial or syndromic groups (neurofibromatosis). Astrocytomas and ependymomas are more common in patients with neurofibromatosis type 2, which is associated with an abnormality on chromosome 22. In addition, spinal hemangioblastomas can develop in 30% of patients with von Hippel-Lindau syndrome, which is associated with an abnormality on chromosome 3. The spinal cord consists of numerous nerve bundles that descend from and ascend to the brain. Electrical impulses are carried and transmitted to facilitate movement and sensation. With intramedullary spinal cord tumors, compression and stretching of these fiber tracts results in loss of the motor and sensory function. As the tumors grow, the patient's neurologic function further deteriorates. Patients with intramedullary glial spinal cord tumors (ie, ependymomas, astrocytomas) typically present with back pain referred from the level of the lesion, sensory changes, or worsening function. The symptoms can be of a long duration, since these lesions tend to grow slowly and typically have a benign histopathology. Patients with low-grade astrocytomas tend to experience symptoms over a mean duration of 41 months. This is in contrast to patients with malignant astrocytomas, whose symptoms persist for a mean duration of only 4-7 months before diagnosis. 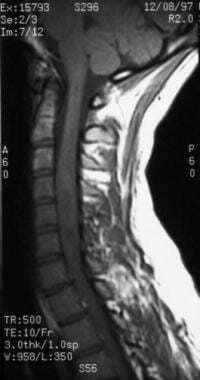 Intramedullary spinal cord neoplasms or tumors are typically histopathologically "benign" or slow growing. However, patients can have more aggressive neoplasms as well as morbidity due to the location of the lesion. Consequently, compared with similar intracranial neoplasms, patients may have a prolonged survival after diagnosis. Optimal treatment options depend on the patient's clinical symptoms and neurologic finding. When and whether to treat these lesions as well as perform radiosurgery or surgical excision of lesions remains controversial. However, cures have been reported only after complete surgical resection. Therefore, patients with neurologic symptoms and confirmatory findings from imaging studies may benefit most from surgical excision, with the surgical goal of total gross resection of the lesion. Understanding the normal spinal cord vascular supply is essential to treating intramedullary spinal cord lesions; specifically because these vessels may have a variable and inconsistent distribution. The great vessels (aorta, carotids) contribute arterial supply to the spinal cord via segmental arteries, which further branch into medullary and radicular arteries. The radicular artery provides extramedullary blood supply to the nerve root and dura; the medullary artery bifurcates into anterior and posterior divisions to form the spinal arteries. One anterior and 2 posterior spinal arteries then transverse the longitudinal axis of the spinal cord and provide the blood supply to the spinal cord. Neoplasms acquire their blood supply by leaching blood from these vessels. The venous plexus of the spinal column, termed the Batson plexus, is unlike other venous systems in the body because the veins do not contain valves. Therefore, blood can have pathologic retrograde flow. This retrograde flow blood can back up and cause venous congestion. This can manifest as venous hypertension. Because oxygenated blood cannot pass through the spinal cord because of the congestion of outflow, patients present with progressive neurologic dysfunction. The spinal cord parenchyma consists of a central canal surrounded by an H-shaped gray matter region that contains neurons. Outer myelinated nerve tracts, termed white matter, surround the central gray matter. The central canal represents an embryologic remnant from neurulation of the neural plate and is lined with ependymal cells. Ependymomas arise from these cells and, therefore, are typically located centrally in the spinal cord parenchyma. In contrast, astrocytes support gray matter neurons and white matter axons. Neoplastic transformation of these supporting cells results in the development of astrocytomas and may occur almost anywhere within the cord. Observation with serial imaging studies over a variable period is a treatment option for patients who pose a high surgical risk, who are elderly, and/or who only have minimal neurologic signs. Patients in whom pathology tissue shows a malignant neoplasm may be best treated with radiotherapy because they are expected to have an accelerated deterioration and complete surgical resection is not possible. Mechtler LL, Nandigam K. Spinal cord tumors: new views and future directions. Neurol Clin. 2/2013. 31(1):241-68. [Medline]. Parsa AT, Lee J, Parney IF, Weinstein P, McCormick PC, Ames C. Spinal cord and intradural-extraparenchymal spinal tumors: current best care practices and strategies. J Neurooncol. 2004 Aug-Sep. 69(1-3):291-318. [Medline]. Samartzis D, Gillis CC, Shih P, O'Toole JE, Fessler RG. Intramedullary Spinal Cord Tumors: Part I-Epidemiology, Pathophysiology, and Diagnosis. Global Spine J. 2015 Oct. 5 (5):425-35. [Medline]. Klekamp J. Spinal ependymomas. Part 1: Intramedullary ependymomas. Neurosurg Focus. 2015 Aug. 39 (2):E6. [Medline]. Saraceni C, Ashman JB, Harrop JS. Extracranial radiosurgery--applications in the management of benign intradural spinal neoplasms. Neurosurg Rev. 2009 Apr. 32(2):133-40; discussion 140-1. [Medline]. Brotchi J. Intrinsic spinal cord tumor resection. Neurosurgery. 2002 May. 50(5):1059-63. [Medline]. Karikari IO, Nimjee SM, Hodges TR, Cutrell E, Hughes BD, Powers CJ, et al. Impact of tumor histology on resectability and neurological outcome in primary intramedullary spinal cord tumors: a single-center experience with 102 patients. Neurosurgery. 2011 Jan. 68(1):188-97; discussion 197. [Medline]. Angevine PD, Kellner C, Haque RM, McCormick PC. Surgical management of ventral intradural spinal lesions. J Neurosurg Spine. 2011 Jul. 15(1):28-37. [Medline]. Constantini S, Miller DC, Allen JC, Rorke LB, Freed D, Epstein FJ. Radical excision of intramedullary spinal cord tumors: surgical morbidity and long-term follow-up evaluation in 164 children and young adults. J Neurosurg. 2000 Oct. 93(2 Suppl):183-93. [Medline]. Haji FA, Cenic A, Crevier L, Murty N, Reddy K. Minimally invasive approach for the resection of spinal neoplasm. Spine (Phila Pa 1976). 2011 Jul 1. 36(15):E1018-26. [Medline]. Manzano G, Green BA, Vanni S, Levi AD. Contemporary management of adult intramedullary spinal tumors-pathology and neurological outcomes related to surgical resection. Spinal Cord. 2008 Aug. 46(8):540-6. [Medline]. Özkan N, Jabbarli R, Wrede KH, Sariaslan Z, Stein KP, Dammann P, et al. Surgical management of intradural spinal cord tumors in children and young adults: A single-center experience with 50 patients. Surg Neurol Int. 2015. 6 (Suppl 27):S661-7. [Medline]. Seki T, Hida K, Yano S, Aoyama T, Koyanagi I, Houkin K. Surgical Outcomes of High-Grade Spinal Cord Gliomas. Asian Spine J. 2015 Dec. 9 (6):935-41. [Medline]. Schubert GA, Barth M, Thomé C. The Use of Indocyanine Green Videography for Intraoperative Localization of Intradural Spinal Tumors. Spine (Phila Pa 1976). 2010 Feb 26. [Medline]. Aghayev K, Vrionis F, Chamberlain MC. Adult intradural primary spinal cord tumors. J Natl Compr Canc Netw. 2011 Apr. 9(4):434-47. [Medline]. Burger PC, Scheithauer BW. Tumors of the central nervous system. Rosai J, Sobin LH, eds. Atlas of Tumor Pathology. 3rd series, fasc 10. Washington, DC: Armed Forces Institute of Pathology; 1994. Casha S, Phan N, Rutka JT. Spinal Cord and Column Tumors in Children. Spinal Cord and Spinal Column Tumors - Thieme. 2006. 1:187-203.
Cooper PR, Hida K. Intramedullary Spinal Cord Tumors. Spinal Cord and Spinal Column Tumors - Thieme. 2006. 315-334. Harrop JS, Ganju A, Groff M, Bilsky M. Primary intramedullary tumors of the spinal cord. Spine (Phila Pa 1976). 2009 Oct 15. 34(22 Suppl):S69-77. [Medline]. Kane PJ, el-Mahdy W, Singh A, Powell MP, Crockard HA. Spinal intradural tumours: Part II--Intramedullary. Br J Neurosurg. 1999 Dec. 13(6):558-63. [Medline]. Mechtler L, Cohen ME. Clinical presentation and therapy of spinal tumors. Bradley, WG, Daroff RB, Fenchel GM, Marsden CD. Neurology in Clinical Practice: The Neurological Disorders. 2nd ed. Boston, Mass: Butterworth-Heinemann; 1996. Osborn AG. Diagnostic Neuroradiology. St. Louis, Mo: Mosby-Year Book; 1994. Sahni D, Harrop JS, Kalfas IH, Vaccaro AR, Weingarten D. Exophytic intramedullary meningioma of the cervical spinal cord. J Clin Neurosci. 2008 Oct. 15(10):1176-9. [Medline]. Saraceni C, Harrop JS. Spinal meningioma: chronicles of contemporary neurosurgical diagnosis and management. Clin Neurol Neurosurg. 2009 Apr. 111(3):221-6. [Medline]. Simeone FA. Intradural tumors. Rothman RH, Simeone FA, eds. The Spine. 3rd ed. Philadelphia, Pa: WB Saunders; 1992. Slin'ko EI, Al-Qashqish II. Intradural ventral and ventrolateral tumors of the spinal cord: surgical treatment and results. Neurosurg Focus. 2004 Jul 15. 17(1):ECP2. [Medline]. Zhou H, Miller D, Schulte DM, et al. Intraoperative ultrasound assistance in treatment of intradural spinal tumours. Clin Neurol Neurosurg. 2011 Sep. 113(7):531-7. [Medline]. This T2-weighted MRI is from a 19-year-old man with 4-month history of progressive motor loss and an inability to ambulate. He underwent spinal biopsy that confirmed an intramedullary glioblastoma. This 28-year-old man presented with progressive tetraplegia. T2-weighted sagittal MRI illustrates an intramedullary ependymoma, confirmed with pathologic evaluation. Note the cysts at the cranial (top) and caudal (bottom) of the tumor. Postoperative axial MRI (patient from Image 3) at distal region of resection. A complete or gross total resection was obtained and confirmed with postoperative MRI. Note the cyst cavity has collapsed and the spinal cord is significantly atrophied. Despite the small size of the spinal cord, the patient experienced significant improvement in his neurologic function postoperatively. The authors and editors of Medscape Reference gratefully acknowledge the contributions of Jennifer Malone, MD, to the development and writing of this article.